Born in Tuscaloosa, Alabama, on December 1, 1948, to George and Regina (Beale) Foster, George Arthur Foster spent his early life picking cotton and hoping, despite his small size, to be chosen for neighborhood ballgames. When he was 8 his parents separated, and he moved to Hawthorne, California, near Los Angeles, with his mother, his older brother, John, and his older sister, Mamie. In Hawthorne Foster played in the same Little League as future major leaguer Dave Kingman. He played several sports at Leuzinger High School in Lawndale, California, but broke his leg playing basketball in his senior year and did not play baseball that spring. Instead, he established a workout routine, gained weight, and got stronger. After high school, while playing in a fall league, he was spotted by San Francisco Giants scout Jack French, and in late 1968, after playing baseball at El Camino Junior College in Torrance, California, Foster was drafted in the third round of the amateur draft by the Giants, the team of his boyhood hero, Willie Mays. The Giants sent the 19-year-old Foster to their low-level Class A team in Medford, Oregon. The next season he advanced to Single-A Fresno, made the 1969 California League All Star team, and led his team with 14 home runs and 85 runs batted in. The 6-foot-1, 185-pound powerhouse was drawing attention, and the Giants called him up after the California League season. Foster’s first major-league hit was an infield single to third base off the Dodgers’ Claude Osteen on September 27. The Giants and Foster repeated the process in 1970: He spent the season at Triple-A Phoenix, where he hit .308 but with less power and fewer RBIs than the season before. Again he got a late-season call-up and on September 25, he hit his first major league home run as a pinch hitter off San Diego’s Pat Dobson. In 1971 Foster made the Giants’ roster as a reserve outfielder, backing up Bobby Bonds, Willie Mays, and Ken Henderson. The reclusive Foster roomed with Bonds, who became his mentor and helped him adjust. Foster avoided the media and rarely engaged in small talk with his teammates, afraid of bothering anyone. His time on the bench, after playing every day in the minors, sent him into a batting slump as he lost 54 points off his batting average during May. On May 29, the Giants traded Foster to the Reds for shortstop Frank Duffy and pitcher Vern Geishert. The trade turned out to be vastly one-sided in favor of Cincinnati. Duffy was traded to the Cleveland Indians after the season and Geishert never pitched again in the majors. But Foster was sorely disappointed. The day he was dealt the Giants were in first place in the National League West Division and the Reds were near the bottom. He was discouraged, but the trade proved to be a blessing for Foster, and for the Reds. Foster became the Reds’ regular center fielder (in part because his predecessor, Bobby Tolan, sat out the entire season with an Achilles tendon injury). Foster hit .241 with 13 home runs for the season, including .234 with 10 homers for the Reds. On September 16 in San Francisco he avenged himself against his old team by hitting a grand slam off Don McMahon in the eighth inning that assured the Reds victory. Still, despite flashes of excellence, Foster earned only a backup role in the Reds’ outfield in 1972 after Tolan returned to the lineup. Foster played in 59 games and hit just .200 with two home runs. His most memorable moment of the season undoubtedly was the deciding Game Five of the NLCS against the Pittsburgh Pirates when, as a pinch-runner, he scored the winning run from third base on a wild pitch by Bob Moose in the bottom of the ninth inning. As his hitting improved, Foster began to admire another player’s hickory stained bat and ordered one for himself. Foster’s big, black, 35 ounce, 35-inch bat was well known. Foster joked about having integrated the bat rack. The 1976 season was even better for Foster. He hit 29 home runs, had a league-leading 121 RBIs, and was voted to the National League’s starting lineup for the All Star Game in Philadelphia. He hit a two-run home run off Catfish Hunter, drove in three runs, and was named the game’s Most Valuable Player. He was named the National League’s Player of the Month in May and July, and the Player of the Year by The Sporting News. He had been in contention for the Triple Crown (home runs, RBIs, and batting average), and finished second to teammate Joe Morgan in the voting for the Most Valuable Player. After Morgan was announced as the MVP, Foster declared that he should have won the award, something he immediately regretted saying.7 The Reds swept the Philadelphia Phillies in the NLCS and the Yankees in the World Series. Foster hit .429 in the Series (6-for-14) with four RBIs. 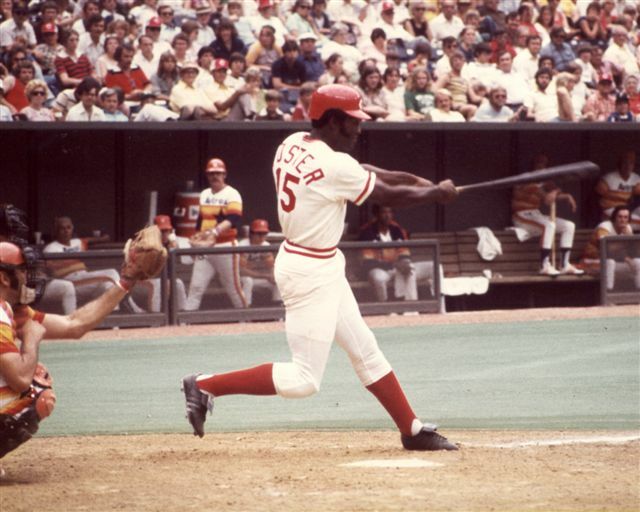 During the season Foster smashed the seventh home run ever to be hit into Riverfront Stadium’s upper deck since the ballpark opened in 1970. In the ballpark’s 33-season existence only 35 home runs were hit there and Foster hit the most, six. Deprived (in his mind) of the MVP in 1976, Foster responded with a better season the next year and copped the award on the strength of a .320 batting average, and being the league leader in home runs (52), RBIs (149), and runs scored (124). Once again Foster was voted to the All-Star Team (he was 1-for-3 with one RBI as the National League won). On July 14, just before the All-Star break, Foster hit three home runs in a game against Atlanta, and he wound up with 12 that month. Of his home run total that season, Foster said, “I saw the ball so well. It seemed almost any pitch would do.”8 Foster’s home run total in 1977 was the most since Willie Mays hit 52 in 1965. The fifty home run milestone not reached again until Detroit’s Cecil Fielder hit 51 in 1990. After the 1977 season Foster combined an exhibition tour to Japan (he was voted the MVP for the tour) with a honeymoon. He married Sheila Roberts on November 3. They later had two daughters, Starrine and Shawna. In 1978 his batting average slipped to .281, but he again led the National League in home runs (40) and RBIs (120). But over the next two seasons his production fell as he battled injuries and missed playing time. He rallied in 1981 and drove in 90 runs in 108 games in the strike-shortened season. Before the next season, on February 10, 1982, Foster was traded to the New York Mets for catcher Alex Trevino and pitchers Jim Kern and Greg Harris. His nearly 11-year run with the Big Red Machine was over. Foster, 33 years old by this time, signed a five-year, $10 million contract with the Mets – the largest in the National League at the time – but struggled from the start. After seven straight seasons of hitting at least 20 home runs, he managed only 13 in New York, and his batting average plummeted to .247. Mets fans took to booing him. Foster improved his home-run numbers in the next three years as the Mets vaulted into contention in 1984 after years of ineptitude. But by 1986, as the Mets were having one of their greatest seasons, the 37-year-old Foster was struggling in part-time play. A comment Foster made in August to a sportswriter appeared to accuse Mets manager Davey Johnson of favoring white players. “I’m not saying it's a racial thing. But that seems to be the case in sports these days,” Foster was quoted as saying. “When a ballclub can, they replace a George Foster or a Mookie Wilson with a more popular white player. I think the Mets would rather promote a Gary Carter or a Keith Hernandez to the fans so parents who want to can point to them as role models for their children, rather than a Darryl Strawberry or a Dwight Gooden or a George Foster.”9 Foster told Johnson and his teammates that his comments had been taken out of context, and some of the teammates supported him, but he was released the day the article appeared.10 With a huge contract and a lackluster performance, Foster was destined to be released anyway. The Chicago White Sox picked him up and he hit a home run (the 348th and last of his career) in his first game with the team, but he was released after three weeks. Foster was a minor-league hitting instructor for the Reds in the late 1990s and later a special instructor with the team. He has also coached in high school and college. He has spent time as a corporate speaker, and with a baseball training organization called the George Foster Baseball Clinic. In 2003, Foster was inducted into the Cincinnati Reds Hall of Fame. During Foster’s playing days he spent time with young baseball players, giving them equipment and instructing them on batting. Dayton, Ohio, sportswriter Hal McCoy who covered Foster when he was with the Reds, called him “the greatest person in baseball,” adding, “I mean as a person, not just as a player. He never raises his voice, no matter how harassed he may be by fans. I asked him once if he’d let me use his name for Building Bridges, an organization for underprivileged kids. He said, ‘No, you’ll have more than my name. I’ll be there too.’ ”11 Foster seeks to teach future ballplayers to work hard and believe in their abilities. This biography is included in the book "The Great Eight: The 1975 Cincinnati Reds"ere" (University of Nebraska Press, 2014), edited by Mark Armour. It is also included "The 1986 New York Mets: There Was More Than Game Six" (SABR, 2016), edited by Leslie Heaphy and Bill Nowlin. 1 Thomas Boswell, Washington Post, August 18, 1976. 2 Cincinnati Reds Yearbook, 1973, 34. 3 Malka Drucker with George Foster, The George Foster Story (New York: Holiday House, 1979), 55-56. 4 Drucker and Foster, 58. 5 Drucker and Foster, 61. 6 Drucker and Foster, 75. 7 Drucker and Foster, 87-88. 8 Drucker and Foster, 94. 9 Gannett Westchester-Rockland Newspapers, August 7, 1986. 10 Joseph Durso, “Mets to Drop Foster Amid Racial Controversy,” New York Times, August 7, 1986. 11 Drucker and Foster, 72-73.